I find it absolutely amazing, how something that maybe weighs 4-5 pounds can cause so much upheaval, upset, stress, destruction and time as well as gagging! Of course I am talking about the neighbourhood skunk. The one that roams the night looking for grubs, garbage, or anything they can find. They love a buffet, and take their time and nothing is to get in their way, including your pets. It can be a constant fight to keep “natural critters” outside and away from your pets and yourself. Once Sasha was done I called her and opened the big patio glass door and just happened to look down and thought for a second we had a stray cat on the step. He was inches from coming in the house. He looked up at me, and then I realized what it was and tried to get the door closed, but too late. Sasha had come bounding to the door and startled the skunk. Basically the skunk “sneezed” out the rear and poor Sasha got it right in the face, and some instantly drifted to me at the door and in the house. It then waddled off as if nothing had happened, leaving my dog whimpering and rolling in the grass, as she took a hit to the face. The house instantly stunk so I went outside with Sasha to stop anymore getting in. Credit: mineIt was a cold night, I had no coat on, and there was Sasha rolling around and me stinking as my jeans got hit. I went and hooked up the hose and sprayed her face as I was concerned for her eyes. My hubby came home from his late shift and was totally grossed out when he came thru the front door and he didn’t have to be a CSI to figure out what just happened. He gave me my phone and I looked up a recipe, and we luckily had these things. 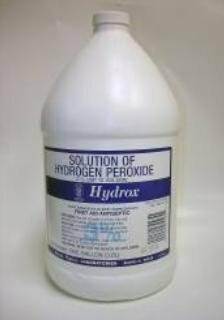 He got the hydrogen peroxide and the other ingredients and came out and we went to work. This recipe works well, but be ready to donate any cloths or towels you use to the garbage because it won’t come out. He mixed this together and we leashed Sasha and held her tight and I closed her eyes with my hands to protect them and then washed this recipe liberally on her with an old cloth. She had tried to use her foot to clean her face so we did her paws as well. Let it sit on for 5 minutes then rinse off. She is a big dog so this involved the hose. We used the spray wand so it was gentler on her face. We then did this a second time, and it was the second time that got rid of it. We dried her off, and then let her in the house. I had to strip off my infected clothes, and we threw the rug out the patio door outside and tried to contain the odour. We gave her a place to lay down with an old blanket. So next was the house. I sprinkled baking soda on the chairs and any fabric nearby, and then vacuumed and that really helped. 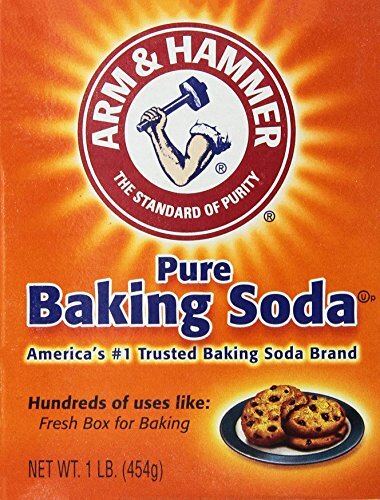 Keep a large box of baking soda around the house, it has great cleaning powers but especially at absorbing odours. Another option if the air in your house is heavy with skunk, is a vinegar solution in a sponge and leave it sitting out, check out the video. We often have things in our house that would work just as well as commercial products. You can purchase commercial products that do the same thing, but sometimes late at night you simply cannot run to the store. But if you have pets that go outside in the evening, it can happen, and it would be a good idea to keep a kit on hand for such occasions. My hubby had to run all over the house to find these products. We will now keep them together in a bucket near the door. If I had of ran in to find them, I would have infected the entire house as I was not smelling like roses either. A hot shower fixed me, but it is much harder for your furry friends. You might think it won’t happen to you as you always walk your dog, but my neighbor walked his dog and it sniffed at a shrub and the skunk was underneath, so yes, it can still happen even if you think you have full control on a leash. There are also ways to get rid of skunks in your yard to lower the chances of getting sprayed, but just like you have a first aid kit around the house, have a skunk attack kit available, and don’t have it way up on the second floor somewhere, have it near an exit, so that you don’t have to run through the house looking for it, infecting the area. This was a 3 hour process that night, and it was the wee hours before we got to bed. It can happen, best to be ready! Write the recipe on a paper and keep the ingredients ready to go, the faster you work at it the better. Get Rid of the Yuk factor and wash that skunk smell off your dog.